Madonna ate this broccoli cheddar soup, right down to the last drop. That’s how good it was. She is not a cheesehead like I am and usually she prefers to make something else for herself when I have a cheese filled meal but not today. Of course it’s possible that she ate it because he couldn’t be bothered cooking but that’s not likely. Me, on the other hand like every other American, would eat cheese on anything. When it’s meal time, I wonder why Australians don’t do cheese like I do. I was at the new Big Top Farmers Market, Maroochydore farmers market the other day just as one of the stall holders was unpacking the last of his broccoli and it was getting close to quittin’ time. I went over to look and he said he’d cut them the day before so I asked for one. He handed over a bag of three heads for $2 and I went home happy. Early in the day I started a loaf of sourdough bread and after it was on its first rise, I wondered how it would be with that dukkah I made the other day folded into it. So when the dough had risen, I flattened it and sprinkled some dukkah over it and rolled it up and then did it again. That’s why it’s not all nutty and seedy throughout. Maybe I should have just sprinkled it on top. It was wonderful with our soup and the table was covered in bread sprinkles because we kept slicing and eating it along with our soup. It was a comforting meal for a relaxing weeknight. half a pinch of cayenne pepper, seriously, that's all it needs but you can add more. salt to taste but the stock and cheese might be salty so I'd wait and test for seasoning after whizzing with the stick blender. In a large pot, add the broccoli, onion, potato, carrot, pepper and stock and cook for 20-25 minutes until the vegetables are mushy and the liquid has reduced. Blend with a stick blender (you can use anything really - a potato masher would work but it won't be as smooth. I only whiz until the big pieces are gone so it's got some texture. Return to the stove and add the milk and cream and heat to near boiling but do not boil. When hot, remove from heat and add in the cheese, then stir to melt. Because everyone's veggies are different sizes, if it's too thick, add more milk. If it's too thin, add more cheese. Test for seasoning and add salt to taste. I needed just a tiny bit. Serve with some crusty rolls or bread. Love your presentation Maureen ! So chic! The soup looks lovely and here is a litte bit cold, then a soupe like this it’s welcome !! I made a nice soup a couple of days ago, and at some point need to blog about it- it was a yellow squash soup, and your soup bowl is similar to mine…. Maureen, the soup looks so hearty and delicious! What’s better than dipping bread in delicious soup? We’ve been having soup for breakfast with the cooler mornings, & yours looks just like a green smoothie doesn’t it? :)) All I see is broccoli. It’s got to be good for you! Your bread would be awesome toasted too I reckon. 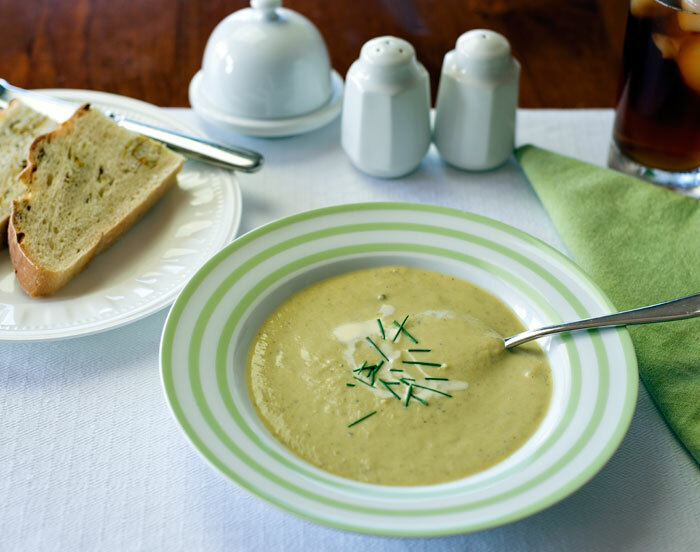 That bowl of broccoli soup with a couple of slices of home made bread is my idea of comfort food. My man isn’t a cheese head either, although he might just turn into one in Europe. I still have hopes, you know. 😉 I usually get acceptable cheddar cheese from south India, somehow this cheese is rather less available in central Europe so I might not get around making this so soon. Except if I may use raclette instead. That, probably is the way to serve brocolli in my house….looks yumm! I like broccoli anything, and I bet this soup of yours is delicious, Maureen! I love when bread crumbs are all over my table……..even the floor. Means eating with gusto. 🙂 This soup looks divine. I would never have thought to use potatoes in broccoli soup. And easy to make too. What’s not to like? Just one small potato. It thickens up the soup without requiring a roux so good for those with problems eating flour. Yum, I would be slicing and eating too and I wish I was right now. It looks fantastic and would be perfect on this cool rainy Carolina day. How long would it take for take out!? Maureen, that’s my kind of meal! A hearty, thick soup and homemade bread — Hea-ven! Supposedly it’s spring here but you would never know it by the weather; another cold and dreary day…which makes it perfect for a soup like this. I love this combination…well done! What a bargain $2 for 3 heads of broccoli. And what a gorgeous bowl of soup – love the idea of folding the dukkha through the sourdough bread I can imagine it was perfect with the hearty soup. A comforting meal that would be perfect for this spring evening as it is supposed to get down into the 30’s. A trip to the farmer’s market, bread-making, dinner with the hubby… Sounds like a perfect night! And this soup has me drooling, Maureen!! I also love cheese on anything! 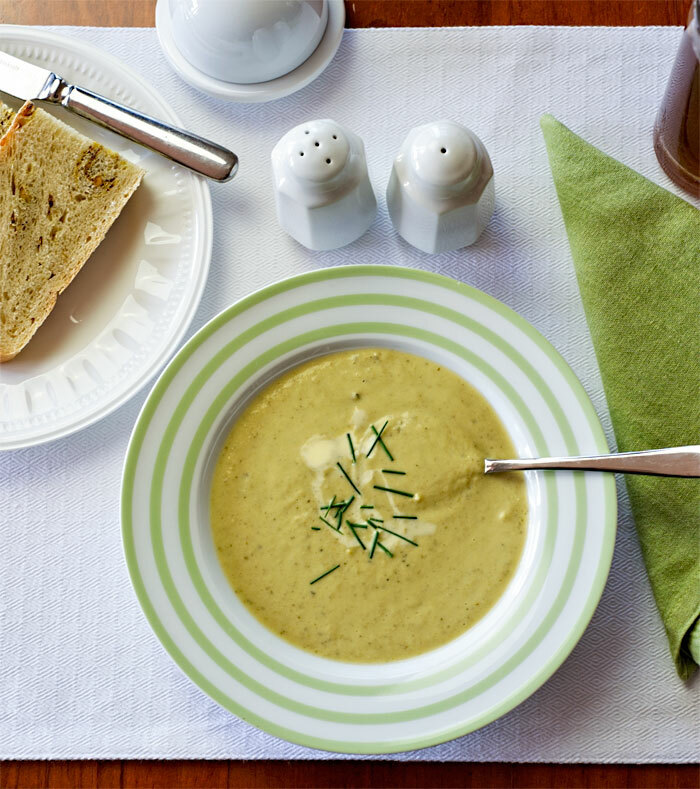 And this Broccoli Cheddar soup is ideal for this chilly weather here Down Under. Would try this soon. I like butter too. My father wouldn’t dip his fries into ketchup, he slathered them with butter. Nuff said. Creamy and delicious and of course you need bread to dip the bread it. I used to make a recipe similar to yours and served it in a bread bowl. I can’t wait to try this with your recipe as yours looks super creamy and delicious. Yarm Maureen, looks the perfect soup for this crazy cold weather, especially with a warm crusty bread roll for licking the bowl clean with. If I had that bread in front of me, I could eat up the whole thing. That soup looks so fresh and hearty. Looks like you had a lovely day. If you see multiple comments, please delete it. Not sure why it’s not going through. Love this soup Maureen!!! Look delicious!! I never think to make broccoli soup but now that winter is almost upon us, I’m definitely going to remember this on my next grocery shop! This looks like my idea of a perfect lunch! Love the bread and the soup, looks delicious! that looks delicious – I love both broccoli and cheese and I never say no to soup – I am also in awe of your bread experiments and a bit jealous – I don’t do much exciting stuff with bread because I want my 6 year old to eat it! We’re getting some local broccoli at the markets that should make a scrumptious cheddar soup. Your recipe is very timely! Thanks!